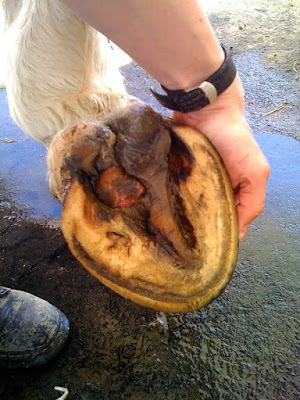 Fran Jurga`s Hoof Blog: News from Hoofcare + Lameness: What's Wrong with This Foot? What's Wrong with This Foot? Foot infections are curious things. A reader sent this in and I thought I'd share it because it seemed unusual to me. Perhaps different parts of the world have different types of foot infections; this horse lives in a very wet climate. I know that we have only just begun to learn about immune system disorders in horses and how they may affect the feet. There's new information coming...but there is also much to be gleaned by going back and reading the old books. It is always said of infections like canker that it affects one horse in 100 and then there is always the story that makes you scratch your head. The city of Cleveland is said to have had an outbreak of canker in the winter of 1894 that practically shut down public transportation because so many streetcar horses were lame; they blamed it on the salt mixture that was used to melt the snow and ice off the tracks. The city switched to sand the next year and never had a mass lameness problem again. 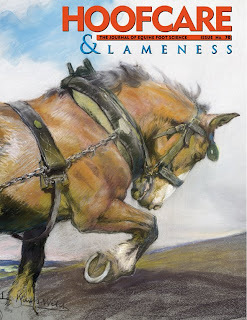 Hoofcare & Lameness #77 had a special section on foot infections--deep sulcus thrush, canker, pemphigus, insect bites, pastern dermatitis, vasculitis, lymphedema and fungal-type infections of the hoof wall. We're now working with Dr. Knottenbelt at the University of Liverpool on an update of his work on some immune disorders that affect the foot and pastern and hope to have some of his brilliant work to share with you soon. But in the meantime, please tell me--and other blog readers--more about this foot. Without the case history, it would be hard to guess, but it could be associated with ORGANISED EXHUBERANT TISSUE associated with the severe heel 1/4 crack this animal is suffering. Again, I agree.....without past history on the hoof, how long this has been in this state, has it grown, changed, sore, etc. Was the horse in shoes? The heel bulb area is totally squeezed out behind the frog/weight bearing area (usually see that when they have been in shoes a lot). this looks like a street draft and that would explain the modification of the hoof capsule. Did you ever find out what was wrong with this hoof? I am seeing something similar. Hi Sarah, no, I don't think they ever were able to get a definite diagnosis of what it was, other than an angry growth similar to canker. As I recall, it was in a very remote location. I hope they were able to treat it.